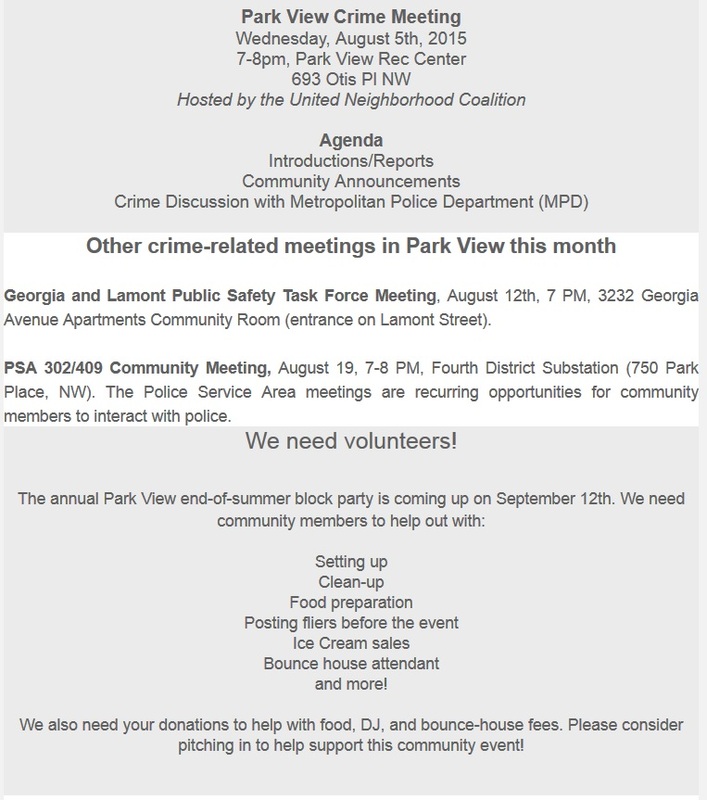 Park View UNC meetings | Park View, D.C.
Last night’s Park View United Neighborhood Coalition meeting was held at the Park View Rec Center from 7 to 8 pm. President Chris Waldmann called the meeting to order and opened the meeting by speaking about how a goal for 2016 will be to collaborate with other neighborhood groups in the area on similar issues. It was also announced that its membership renewal time, and members can renew both at one of the meetings on online at the UNC Web site. Vice president Marcus Hedrick provided a brief overview on both the redevelopment of Park Morton and the status of the Bruce Monroe park. After attending many of the meetings on the redevelopment of Park Morton, he reported that there are still a number of issues that haven’t been fully decided with the plan, but that he has seen that the development team has been responsive to community feedback in the meetings and have incorporated some of what they’ve heard from early meeting in subsequent meetings. 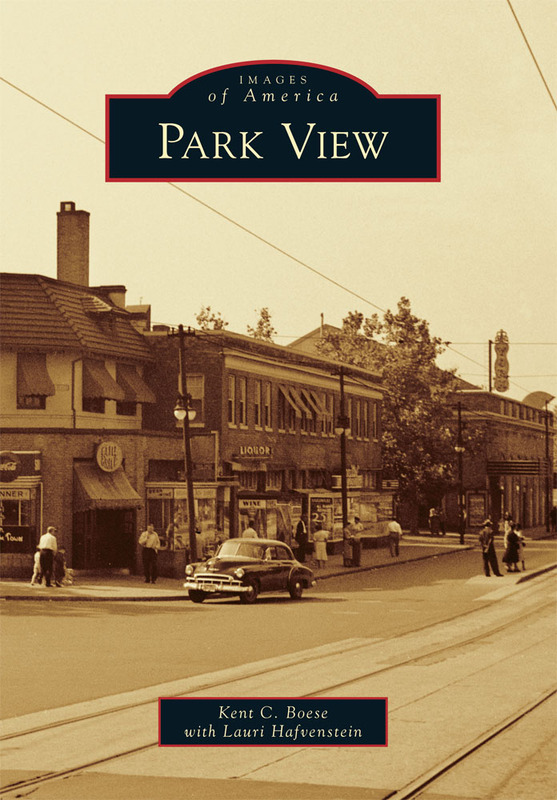 Sarah Sorscher provided an overview of the streets working group efforts and noted that another meeting will be scheduled for later in January … and Sherita Alexander gave a brief introduction to her efforts with the Friends of Park View Playground organization. Much of the evening was spent discussing issues and the types of activities or guest speakers that people would like to see in 2016. There was an early discussion about crime and stability in police officers assigned to the area. One of the points made was that officers tend to get assigned to our area, and then a year or so later they are promoted and moved out of the neighborhood, requiring residents to start from scratch and build new relationships with new officers. This happened (again) recently with the promotion of Lt. David Augustine who was a strong force in PSA 409 (north of Park Road). Gabriel Rojo from the Mayor’s office was in attendance and was requested to report back to the Mayor that the community should have the same stability in MPD deployments that other neighborhoods have. How to assist seniors and those with disabilities in shoveling walks this winter. After discussing these topics, time expired and the meeting came to a close. Mayor Muriel Bowsers attended the November Park View UNC meeting and took questions on a number of issues including crime, school modernizations, vacant and blighted property, bike lanes, and the redevelopment of Park Morton. A resolution opposing the parking variance for the development at 3701 New Hampshire Avenue unless the building is denied parking passes for street parking (editor’s note: ANC 1A supported the requested variances). Upon the Mayor’s arrival, the meeting settled into a question and answer session after opening remarks. 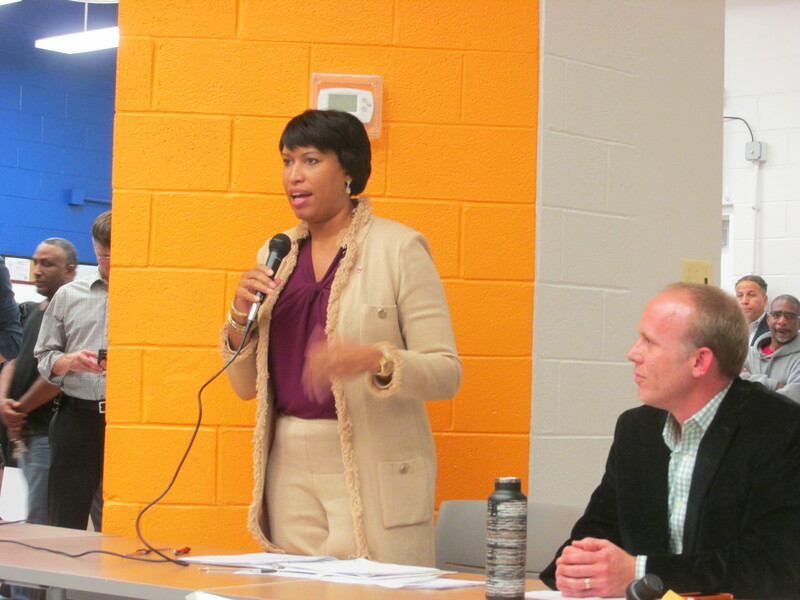 Early questions related to school modernizations, recreation center improvements, and the Pepco-Exelon settlement agreement. There was also a notable focus on crime, public safety, and sustained law enforcement initiatives. During the public safety discussion officers of both the Third and Fourth districts spoke specifically about actions they are taking in the community. As expected, the subject of the Park Morton redevelopment — and the use of the Bruce Monroe property as part of the project — arose and was the focus of much discussion. Mayor Bowser stated that the redevelopment of Park Morton is a long standing commitment and part of the New Communities Initiative. A major part of the New Communities goals is to not displace residents from their current neighborhoods by building replacement housing first. Leading in to the discussion on the selection of the Bruce Monroe site as the best available option for the build first parcel, the Mayor asked if people had looked up and down Georgia Avenue for available land? The room erupted in many people shouting out suggestions of privately owned and/or alternative parcels as alternatives. Order was quickly regained and New Communities Director Angie Rodgers provided an overview of where things currently stand with the process. The Mayor also stated that whatever happens at the Bruce Monroe site it will include park space as part of that plan and that she wouldn’t support any proposal that didn’t have park space in it. As the planning is still in the very early stages, there is no timeline for breaking ground as yet. In the course of the dialogue, the Mayor stated more than once that the current use of the Bruce Monroe site is temporary and that the property has always been intended to be developed. She also offered that it is a large parcel and can support a lot of what the community wants on the site. Additionally, the Mayor stated that the neighborhood is not realized the full benefit of the parcel because it is falling short of the full benefits that could be achieved there. In response to those suggesting that 1125 Spring Road or 965 Florida Avenue include some replacement housing for Park Morton, two themes came through that caught my attention. 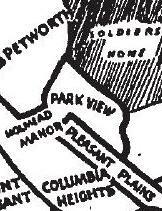 The first was that neither of these locations are in the Park View community. The importance of this goes back to the goal of avoiding displacing residents from their current neighborhood. The other theme with regards to 1125 Spring Road was that that development has become more complicated than originally anticipated and that it would be inappropriate to have a conversation about its redevelopment without the residents who live around it as part of that conversation. Despite all the work that went into redevelopment plans for 1125 Spring Road in 2014, Mayor Bowser shared that the city has encountered some legal hurdles to transferring the property to the Housing Authority. Instead, the property is going to need to have an open bidding process and that the community engagement process will need to be restarted. Most likely, the property will go through an Our RFP process. The evening closed with Ms. High speaking about her concerns with the redevelopment of Park Morton. As a resident of the complex, Ms. High expressed concerns about being displaced and being safe, and commented that all the residents of Park Morton deserve to be treated fairly. A community meeting focused on the topic of redeveloping Park Morton has been scheduled for November 16th at 6:30 pm. It will be held at the Bruce-Monroe @ Park View Elementary School. Rats are a longstanding problem in Park View. Like any animal, they need shelter, water, and food to survive. Learn how to get the city to help you and your neighbors control the rat population on your street by making conditions less attractive for rodents. The Park View United Neighborhood Coalition has not taken a position on what should happen to the former site of Bruce-Monroe Elementary School (currently a temporary park). At the September meeting, we will discuss what members want for the park, so the UNC can advocate for that goal. Additionally, the 3rd annual Park View UNC block party is scheduled for September 12 from 2-6 pm. If you are interested in volunteering with the set up and other jobs, you can do so by contacting Elanor Starmer (elanor (dot) starmer (at) gmail). Donations are also being accepted via the Park View UNC Web site. After the sitting of the new board, the meeting centered on the next steps for the organization. Among the issues that were raised about the organization were the need to consider expanding the borders of the organization, the need to better partner with area businesses, and the need to review and update the organization’s by laws. Issues related to the neighborhood included organizing community clean-ups, working with the Mayor’s Office to organize neighborhood Fix-Its, and evaluating how to effectively communicate within the neighborhood. I’m a strong supporter of civic groups and believe they are important allies in working with the city and advocating to get much needed improvements and services in the community. I look forward to working with President Hedrick and the entire board to move Park View forward in 2013. The October, 2010, Park View UNC newsletter is now available. The next meeting will be held on Wednesday, October 6th, at the Park View Recreation Center at 7:00 p.m.